The popularity of soccer is definitely on the rise, and there are more people watching and playing this sport in the United States than ever before. A Harris Interactive poll found that soccer ranked as the fourth favorite sport in the United States at the beginning of 2015, which is a relatively quick change in rank since its spot as fifth favorite sport in 2012 (Harris Interactive). A poll conducted each year by ESPN ranks soccer as the fourth most popular sport in the country every year since 2006 (ESPN). In 2011, ESPN’s poll found that soccer was the second most popular sport for youth between the ages of 12 and 24 (ESPN). As even more evidence of the growing popularity of this sport, the 2015 FIFA Women’s World Cup Final was watched by more people than the 2015 NBA Finals or the World Series in 2014. Plus, as of 2012, 30% of households in the U.S. had at least one person who played soccer (ESPN). 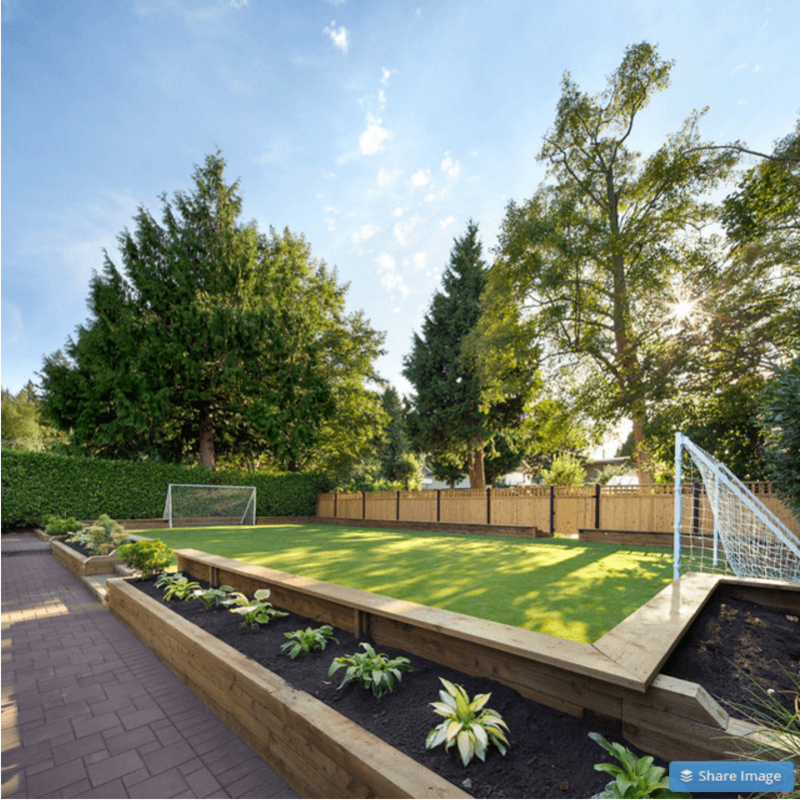 With soccer becoming more popular both as a spectator sport and as a sport played by children and adults, backyard soccer fields are also becoming more common. The smallest recommended soccer field size, which is for the youngest players, is a minimum of 15 yards wide and 20 yards long. This is not going to be an option for most homeowners but, if you have the space, you could consider installing a field of at least this size for practice or pick-up games. If you do not have this type of space available in your yard, you can still set up a practice field that will allow kids or adults to improve their footwork, perfect their free kicks or hone their goalie skills. Aside from the space requirements, very little is needed to set up an area for soccer practice in your backyard. With a level surface, at least one goal and a soccer ball, you or your kids will have all you need to polish your skills on the field. 1. Space: Do you have enough space for a goal and practice area? Determining how much space you can spare for your soccer field should be your first consideration. Once you know this, you can decide the size of the goal you can include, whether you have room for one or two goals, and if you can proportionately divide your field to include a penalty box and other features. 2. Number and Size of Goals: The recommended goal size for youth players is six feet tall and 18 feet wide. For adults, it is eight feet tall and 24 feet wide. If you are practicing for league play, it would be best to use regulation-size goals. However, if you have a smaller backyard that will not allow for this, you can still get in plenty of practice with a smaller goal. 3. Fencing: Fencing the perimeter of your soccer field is not a necessity, but you may want to consider it if you are concerned about wayward soccer balls hitting your house or finding their way into your outdoor living areas. 4. Surface: While you can technically kick a ball around on just about any surface, you are most likely going to want to choose between natural grass and artificial grass for your backyard soccer field. We will address this issue in the next section. Backyard Soccer Fields: Why Choose Artificial Turf? Some community and professional soccer fields have synthetic turf and some have natural grass. While professional soccer pitches with natural grass continue to outnumber those with fake grass, synthetic turf fields are becoming more common and the numbers are beginning to level out. In fact, the 2015 FIFA Women’s World Cup was played on artificial grass. As with other sports that are played on both artificial turf and conventional grass, some players prefer one, while other players prefer the other. 1. Manufactured grass is low maintenance. Natural grass requires regular watering, mowing, aerating, fertilizing, weeding and edging. Low-maintenance synthetic turf requires very little maintenance to function properly and look great. 2. Artificial turf can help limit chemical exposure. 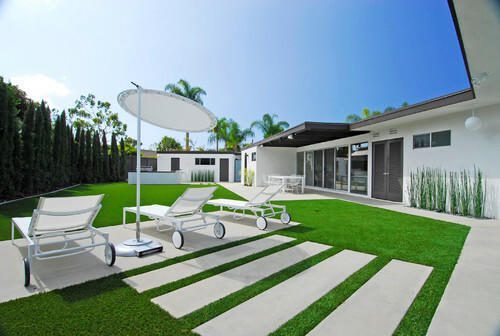 Fake grass requires no chemical herbicides, fertilizers or pesticides, which may help you limit the amount of chemicals in which your family comes in contact. 3. Synthetic turf is cleaner. We all know that kids and pets can track mud and wet blades of grass into the house after rain or irrigating the lawn. This is not a problem with fake grass, which means you and your kids can play soccer any time without tracking in mud and wet grass. 4. 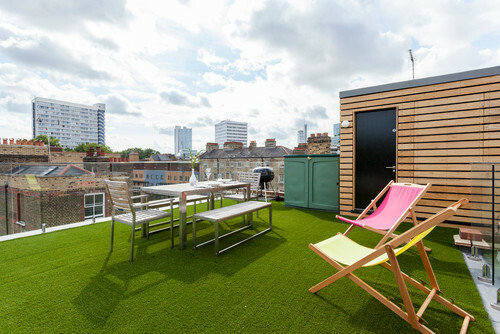 Artificial grass provides a level, even surface. If you, your friends and your kids are going to be playing soccer in your backyard, you are sure to want to limit tripping hazards and make your backyard soccer field as safe as possible. While natural grass lawns can have divots and mounds that can increase the risk of tripping, a properly installed synthetic grass field provides a level, even surface with fewer tripping hazards. 5. A manufactured turf field can serve multiple purposes. While a natural grass lawn can be used for more than just a backyard soccer field, you can get even more use from an artificial lawn. 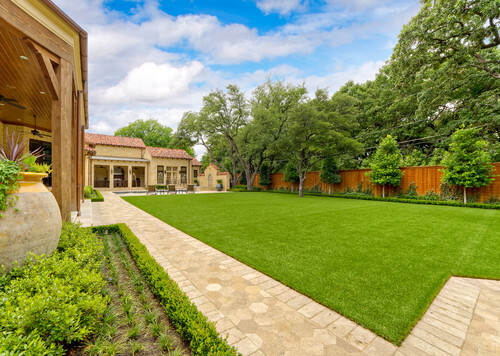 The level, mud-free surface provided by fake grass can be used as a play area for pets or kids, a multipurpose field for a variety of other sports, an everyday outdoor living area or an upscale outdoor entertaining area for dinner parties. This can be particularly helpful if have a smaller backyard. Here are two articles that are worth reading if you are interested in learning more about the safety of artificial grass versus natural grass and the general opinion of professional athletes and associations towards artificial grass versus natural grass. If you need more convincing that a backyard soccer field could be a good addition to your backyard, here are three articles about backyard features that help encourage kids (and adults) to spend time outdoors and to stay active.